Brightening up the typical Dutch landscapes with a patchwork of color, the beautiful flower fields of the Netherlands are known throughout the world. Attracting numerous visitors from various countries each year, flowers are also a prosperous industry in the Netherlands, with the country being the largest flower exporter in the world. At the heart of the international flower trade is Aalsmeer, a city in North Holland, that’s home to the Royal FloraHolland flower auction – the largest floral market in the world. What’s the FloraHolland flower auction? The Royal FloraHolland flower auction gives you a behind-the-scenes look at the Dutch flower trading center, the entire auction process, and the logistics of the famous export. Dubbed ‘the Wall Street of flowers’ by Forbes, over 30 million flowers and plants are traded daily here. Held each weekday, the enormous auction building is a hive of buzzing activity, with 90% of all Dutch flower trades taking place here. The auction warehouse is also an impressive site in it’s own right. Officially the largest trade building in the world, the complex covers the same amount of ground as 200 football fields. To put things in perspective, if you stand at the end of one side of the complex, you’d be struggling to see the other side. they’re restricted to observing the action from the gallery above. But with the colorful flowers stacked side-by-side on rolling shelves, they create a vibrant patchwork meadow when viewed from above, and from here, you can also observe the logistics involved in the auction process. Watch as endless numbers of mini-trains hauling carts loaded with flowers and plants whizz around the factory floor, before making your way to the auction room, where you can feel the tension as buyers bid against the clock. The Dutch style of bidding works a bit differently. 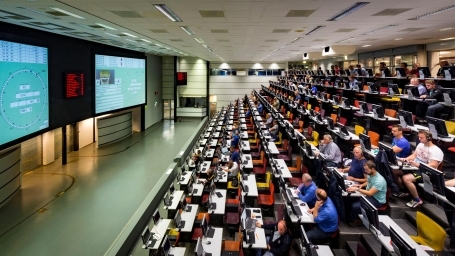 Rather than bidding up the flower price, Royal FloraHolland’s auction bids down. The bidding starts with the highest price, and then steadily drops, tempting buyers to stop the clock before someone else does. The clock then resets and a new flower is auctioned. The entire process is efficient and moves incredibly fast – with millions of flowers selling each day. The bidding is done entirely on computers, with many auction participants doing their bidding remotely. Although the auction room is fairly quiet, it’s interesting to stop by and see how much each flower sells for. Then, from Schiphol airport, the flowers that have been sold can be sent across the globe. It’s an impressive thought that you can buy a bouquet of fresh Dutch flowers in New York, on the same day that they were sold in Aalsmeer. Flowers have long been an economic force in Holland, with Tulips in particular playing a major role in the country’s economy. In the 17th century, Tulips become a major trading product, selling for incredibly high prices due to interest and speculation. Sometimes selling for as much as a house, the value for a single Tulip had escalated to an insane extent. When a plant virus struck in 1673, the bubble burst, causing the whole value system to come crashing down and thousands of people to lose everything. The Aalsmeer Flower Auction has been around since the early 20th century, with two auction houses appearing in 1912. 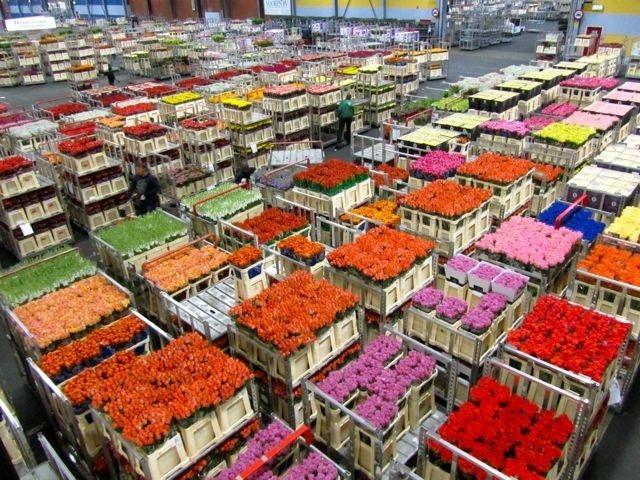 Due to increasing exports and interest in the flower market, the flowering industry in Aalsmeer needed a spacious warehouse to conduct the auctions, and store the flora before it was exported. In 1968, the two existing Aalsmeer auction houses merged, and the present day Aalsmeer FloraHolland Flower Auction was born. In 1972, the warehouse you visit today was opened, and has continued to grow ever since. The traditional way of auctioning has changed greatly, thanks to technology. From buyers participating in the auction remotely, to improvements to the digital bidding platform allowing buyers to see photos and descriptions of the flowers, technology is ever-changing the way we buy and export. It’s said that the auction floor was once a lot noisier, with a lot more interaction, before technology came in and made the process completely electronic. Many of the flowers never even make it to the auction warehouse in Aalsmeer, and are instead shipped directly from where they are stored. Most flowers are even sold before they’re grown and harvested, since the demand for them is so high. 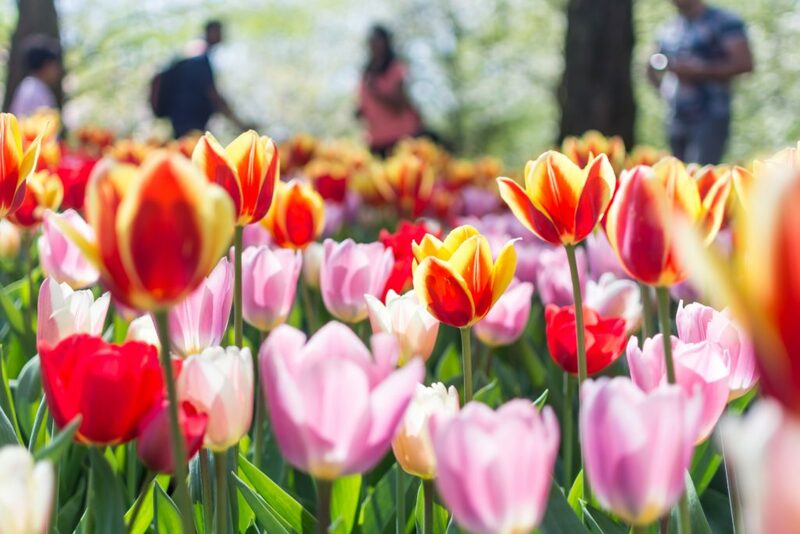 As impressive a place as the Royal FloraHolland’s flower auction in Aaslmeer is, visitors should keep in mind that it’s not Keukenhof – the famous Dutch flower park where over 7 million flowering bulbs can be admired each year. Rather than wandering amongst the flowers, like you can at Keukenhof, at the flower auction you’re restricted to observing the action. Set your alarm clock and get to the auction early to admire the action at its busiest. The earlier you arrive, the more you’ll get to see. The auction takes place in the early hours, with the flowers already starting to arrive the night before. Set off on a self-guided tour through the auction complex, where you’ll find information signs explaining all aspects of the process (in multiple languages). * Monday, Tuesday, Wednesday and Friday from 07:00 to 11:00 hrs. * Thursday from 07:00 to 09:00 hours. If you wish to combine your visit with a trip to Holland’s famous flower fields, April is prime time. During this month, the flora will be in full bloom, coloring the Dutch landscapes with those postcard-worthy views. Just a stone’s throw from Schiphol airport, the flower auction in Aaslmeer is easily reached. Parking is free for visitors, or you can take the Connexxion bus 357 that travels from Amsterdam Central Station and stops right in front of the door of the complex.